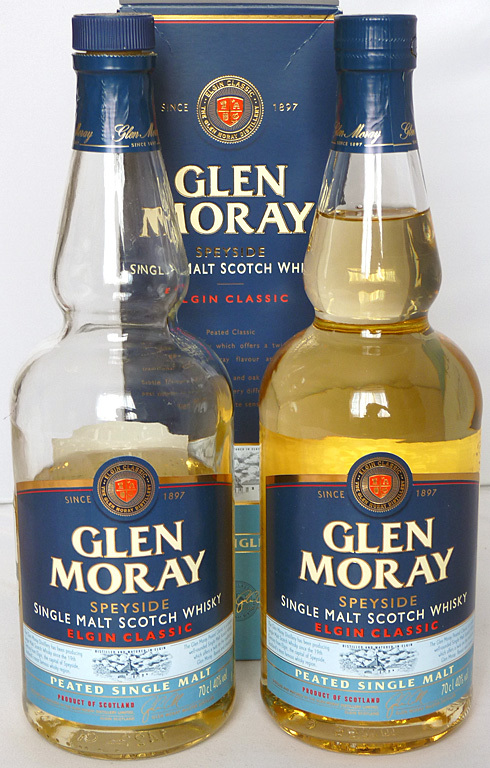 As you can see from the photo below I really like the new Glen Moray ‘Peated’ – or do I? Perhaps I just love the price. At a pocket-friendly £20 (when on offer) it’s one of the cheapest single malts you can buy. But if it were rubbish I wouldn’t go back for more. Glen Moray are masters at filling that budget whisky gap slightly below the Glenlivet Founder’s Reserve and Glenfiddich 12yo. The excellent Aberlour 10yo can sometimes drop to £20 but where are the Islay malts?! Where is that hit of peat at a budget price?! Glen Moray spotted the gap in the market and decided to fill it. When I first bought the Glen Moray ‘Peated’ a few months ago it was scoring over 82/100 on Whiskybase. Now more votes are in the score is starting to level off. But over 80 is excellent, especially when you look at the Glen Moray ‘Classic’ which scores 77/100 (from 8 member votes). The ‘Peated’ is certainly not an Islay but that shot of peat makes it more interesting than the ‘Classic’ Glen Moray. If you see the Glen Moray ‘Peated’ on offer for £20 or less I’d recommend getting it. As a budget whisky I’d say it was in my top 3 along with the Aberlour 10yo and ASDA ‘Extra Special Islay Malt’. Once you’re up at the heady-heights of £25 it’s a whole new ball game with the likes of the Highland Park 12yo in there but that’s a different story. The fact I bought a second bottle of this Glen Moray without thinking “I should save my £20 and put it towards an Ardbeg 10yo” speaks volumes for how good this budget whisky is. Or perhaps it just confirms what a miser I am! When it was discovered that the Glenlivet Founder’s Reserve was replacing the 12yo, I was amused to read on forums at the number of people intending to rush out and stock up on the old version. Really?! I don’t remember it being that good. The Founder’s Reserve may only score a lowly 76.63 on Whiskybase but the 12yo is hardly miles ahead with 77.36/100 from 333 votes. Comments for the 12yo suggest it was an ‘average’ and ‘entry-level’ whisky. That’s hardly scary boots for the Founder’s Reserve to fill. Jim Murray in his Whisky Bible is quite damning about the Founder’s Reserve. He remarks “really can’t believe what a shy and passionless whisky this is (not to mention flawed). The strength gives the game away slightly as to where the malt is positioned. But I had hoped for a little more than malty tokenism.” His score of 78.5/100 is one less than the discontinued 12yo but still in the same category of “average, and usually pleasant but sometimes flawed”. One thing you can count on is that long established distilleries like Laphroaig, Macallan and Glenlivet know their market. They know what each sector requires. In the case of the Founder’s Reserve, an average, entry-level whisky, in the low-end price bracket. And that’s exactly what it is. Available in most UK supermarkets, it’s only worth buying a bottle when it’s on special offer (around the £22-£25 mark). Morrisons, bless ’em, caught me again with another tempting reduction on a new line of whisky. 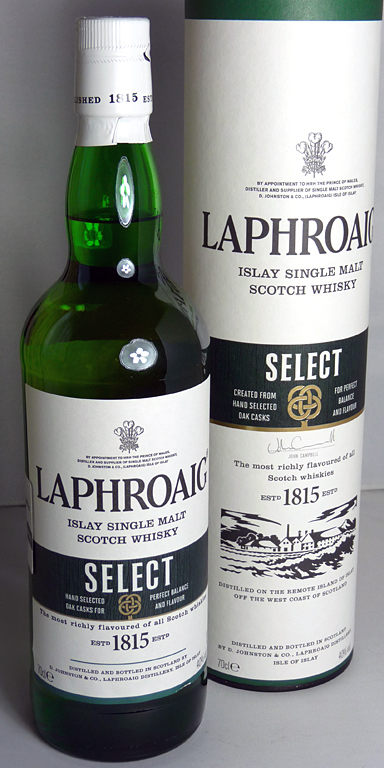 So smitten was I that I didn’t look for any reviews of this new, non-age statement release from Laphroaig. Why should I, since Laphroaig are hardly going to be releasing a mix of vinegar and pee onto the market?! Although, there have been rumblings on the whisky malt vine for a while that standards have slipped at the distillery. And some lovers of the classic 10-year-old see this ‘Select’ as an indication that Laphroaig are taking the same road as Macallan. With this is mind, I wasn’t surprised to read some negative reviews of the ‘Select’ on the internet after my purchase. Thinking I’d bought a dud, I was surprised and delighted when my Whisky Bible 2015 arrived in the post including a score of 89/100 for this new Laphroaig. This classifies it as “very good to excellent whisky definitely worth trying”. It’s a shame it’s not 46% and unchillfiltered but I guess we can’t have everything for £26. Thankfully it says on the back of the tube that the Select is “natural colour”. Falling just short of 80/100 on Whiskybase might not seem brilliant but the members who have left comments are generally very favourable. When this ‘Select’ is at full price it’s not much different from the 10-year-old, but it’s worth a punt if you see it at a discount. Having not tried Bulleit before, Morrisons’s tempting offer of £22 suckered me in. As low as that might seem, the same bottle is selling in Holland for €21.60 (£17), so it’s hardly the bargain of the year. Nevertheless it’s a new bourbon to my growing American collection. There was a 40% version of the ‘Frontier Whiskey’ but this is the stronger 45%. Not that ‘stronger’ always means better. The Whiskybase members have the 40% version scoring 80.63/100 and my 45% bottle languishing behind with less than 79.5/100. But hardly much of a difference to notice. Comments include “great nose, and ok mouth and a poor finish” and “pleasant enough dram – quite a short, stocky after taste leaving the tongue with a pleasant coating”. Recently I posted about the new Ardmore Legacy replacing the (arguably) better Traditional Cask. 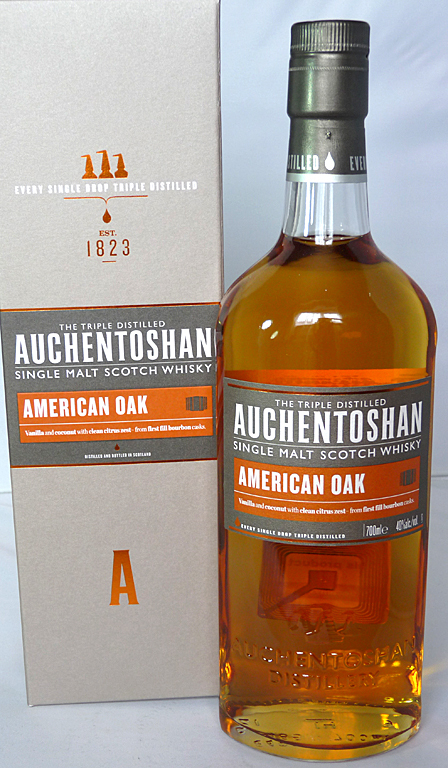 We now have the Auchentoshan ‘American Oak’ replacing the ‘Classic’. Thankfully it would seem Auchentoshan have got it right and this new release is an improvement on the old Classic. To be fair, it wouldn’t take much. The Classic wasn’t bad, just not exactly good either. A score in the 70s out of 100 was all it was worth. Jim Murray in his Whisky Bible 2015 doesn’t have much to say about the American Oak but 85.5/100 classifies it as “very good to excellent whisky definitely worth buying”. He summaries with “quite creamy with some toasted honeycomb making a cameo appearance”. It wouldn’t be right to discuss Auchentoshan without mentioning the Toshman, Mark Dermul. If anyone knows Auchentoshan it’s Mark, so I watched his YouTube review with interest. He agrees with Mr Murray that the American Oak is an improvement on the Classic. I got Mark’s rating of 81/100 from Whiskybase where the average score to date is 73.2/100 from 7 reviews. Not exactly great. Perhaps Auchentoshan is more of an acquired taste, being one of the rare Lowland spirits. If I’d saved all the money I’d spent over the last year on inferior whisky, I’m sure I could have bought a 30yo bottle of Highland Park by now. But with whisky I’m inclined to go for quantity before quality. I’d rather get 20 bottles of £20 so-so whisky than spent £400 on one bottle. I can guarantee I wouldn’t sip the expensive bottle and think “mmm, worth every penny!” I would expect a £380 difference between a cheap and expensive whisky to mean the 30yo Highland Park would blow my mind. It wouldn’t. And neither will the Singleton ‘Spey Cascade’ but, for £24.69, you know what to expect. In winter 2013 I resisted buying the Singleton 12-year-old when it was reduced to £22 in supermarkets because the reviews were poor-to-average at best. 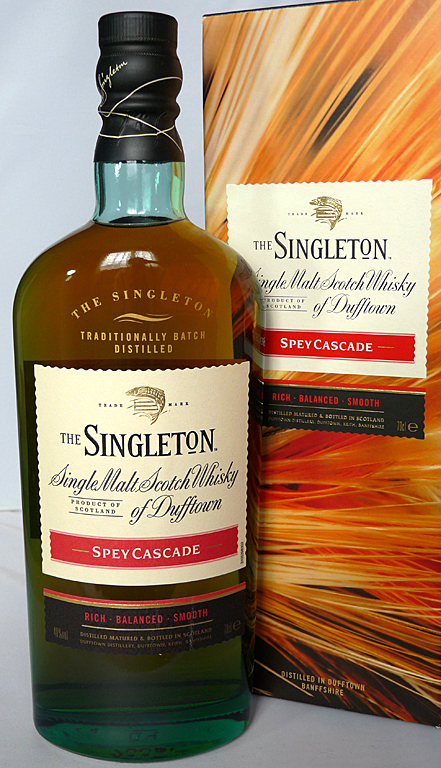 Finally this new Singleton NAS (non-aged statement) ‘Spey Cascade’ suckered me in. If nothing else, it has a nice bottle shape. Initial votes on Whiskybase didn’t look very promising (low 70s) but after 92 votes it’s climbed to nearly 77/100, which is respectable.